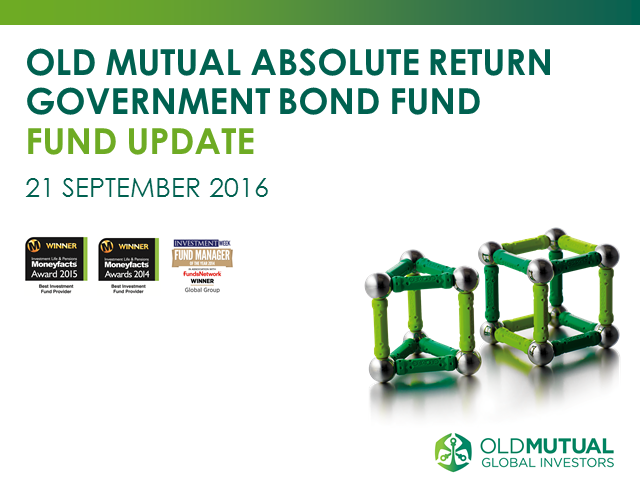 Old Mutual Absolute Return Government Bond Fund update - September 2016. Dr Ian Heslop, head of global equities, and Justin Wells, strategist, global equities, will update you on their analysis of the market environment, changes in investor sentiment and appetite for risk. Please join Mark Nash, head of fixed income, and Nicholas Wall, portfolio manager, for a webcast in which they will discuss the outlook for fixed income markets. Central bankers have been turning more hawkish in recent months, and there’s good reason to suggest bond yields in developed markets outside of the US are set to rise. The discussion will cover fund performance and positioning, macro-economic conditions, the outlook for emerging market debt and yield, risk and inflation trends. Please join us on Monday 8 October for our quarterly review call to discuss the performance of the Merian Global Equity Absolute Return Fund (GEAR) and long only funds managed by the global equities team. Dr Ian Heslop, head of global equities, and Justin Wells, strategist, global equities, will update you on their analysis of the market environment, and changes in investor sentiment and appetite for risk. They will detail how the strategies have adapted to recent short-term market rotations in style and sectors, and as always will be happy to take your questions. Please join us on Thursday 5 July for our quarterly review call to discuss the performance of the Old Mutual Global Equity Absolute Return Fund (GEAR) and long only funds managed by the global equities team, including the Global Equity, North American Equity and Asia Pacific Funds. Dr Ian Heslop, head of global equities, and Justin Wells, strategist, global equities, will update you on their analysis of the market environment, including recent political uncertainty, and changes in investor sentiment and appetite for risk. In this latest video update, Anthony Gillham, Head of Investment of Old Mutual Wealth's Multi- Asset discusses market events in May.